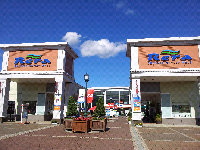 Re Ra Factory Outlet near Shin Chitose airport is worth visiting. The shops are laid out like a village with about 100 shops (according to their guide). Virtually has all the brands you can think of or ones you never heard of, also plenty of entertainment for kids like shows and play areas. You can catch the airport bus which drops you off at next to the train station and walk about 500 meters, cost is about 1000¥. Sorry about the quality of photo as it was uploaded from my phone.